For 300 years we have lived in an Industrial Society and ended up with an Industrial(ized) Education. While this has serious drawbacks, it has also democratized education and provided (in western countries) highest adult literacy rates, higher welfare and higher income for everyone (including the poorest ones). When we speak negatively about Education, we have to keep in mind to throw dirty waters away while keeping the child in. The Digital Revolution and the upcoming of the Information Society have changed, radically and forever, the landscape as we knew it, due to drastic reductions of transaction costs and the end of scarcity of knowledge based goods. Amongst other things, we necessarily need to redefine concepts such as efficiency and efficacy, upon which we have built our education systems. And, thus, rethink the design of those education systems. After pointing out some aspects of the current education system that are being critically challenged by the digital revolution, I suggested one path and one goal to be able to do the transition from an industrial education to a digital one. The path could be based on appropriation of the technology, its adoption/transposition to our actual system, improvement of current practices, and total transformation of instructional designs. On the goals side, I go macro and think of empowering people with the ability to design their own learning strategies, powered by personal learning environments. Please see below my presentation. You can also visit my bibliographic file for De la enseñanza de las instituciones al aprendizaje de las personas (the original title) for downloads both in English and Spanish. 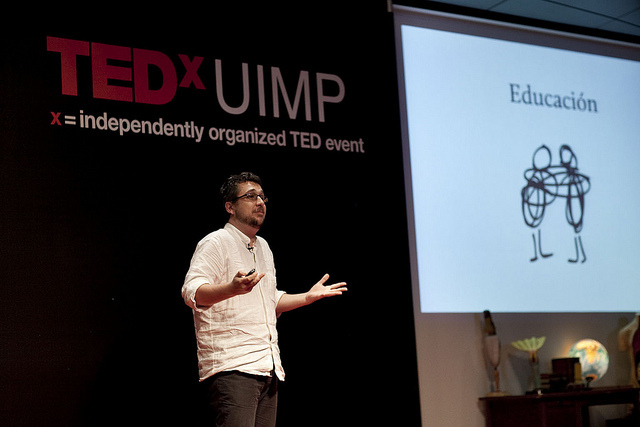 There also is a photo set of the whole TEDxUIMP 1st edition on the Challenges of Education in the XXIst century featuring Juan Freire, Tíscar Lara, Felipe G. Gil, Jordi Ros and Dolors Reig.